WELCOME TO A HAPPIER SUMMER! Get Your Reps is the flexible, drop-in style improv practice that you've been looking for to fill your summer improv jones. Every Monday (all level), Tuesday (advanced), Wednesday (all level), and Thursday (advanced) provide you with a rotating cast of experienced teachers to guide the fun, provide directed feedback, and most importantly, give you time to play! A vital part of your growth as an improviser is having that time to try out all the things you've learned so far and get those concepts into your muscle memory - that's where Get Your Reps comes in! The goal of Get Your Reps is to give you as much time onstage, in scenes and games, as possible. Class size is limited to give you plenty of reps. Summer improv playtime with your friends and soon-to-be friends! 1.) May 25 and on: Click here to purchase Your Season Pass, which are available in unlimited five- or ten-class packages. (If you get flummoxed, check out the FAQs below where we've tried to anticipate your every issue.) Click here to purchase your Individual Class. 2.) Anytime: Use the link in your confirmation email from Brown Paper Tickets to reserve your spot for each particular class that you have the prerequisites to take. * Space is limited in each class and reservations are required. On the Brown Paper Ticket link, click the drop-down menu to select the individual date you'd like to reserve your class spots for free for Season Pass holders. If you're buying a class individually, you'll be charged when you make reservations. Unless a class is full, reservations stay open until 6pm on each class night, so feel free to be spontaneous and grab a spot at the last minute. If you're not able to attend a class, your reservation must be canceled via Brown Paper Tickets within 24 hours of the class to avoid being charged for that class. 3.) In class: Sign in on the Get Your Reps attendance list. 4. ) Every day: Have more fun than anyone! 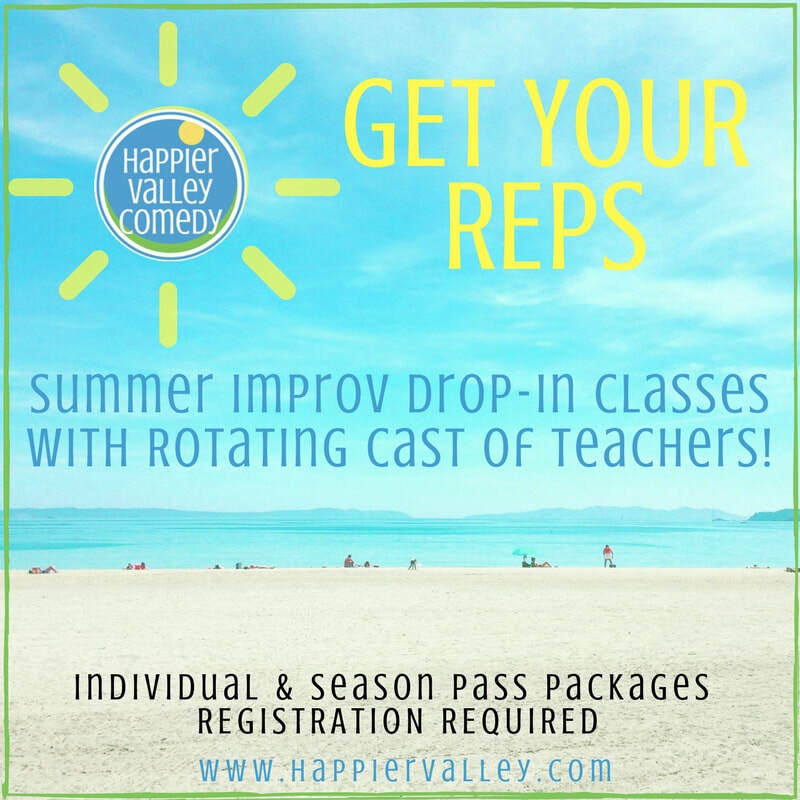 Get Your Reps is only for current or past Happier Valley Comedy class students. You must have completed Zen of Improv 1 to participate in any Get Your Reps drop-in. TEACHERS: We've got a rotating cast of teachers, such as Laura Patrick, Kelsey Flynn, Casey Grambo, Julie Waggoner and, of course, Scott Braidman and Pam Victor. Plus a special guest teachers here and there. For the most updated list, check the details on the HVC Calendar to see who is teaching each specific evening. Also scroll down to the bottom for a tentative line up of teacher. How do I buy a season pass? If you like step-by-step explanations, click here for one from Brown Paper Tickets. i bought my season pass. do i need to do anything else? 1.) The Planner Plan: Use the link in your confirmation email from Brown Paper Tickets to reserve all your spots now using the drop-down menu. (I'm sure you'll note them carefully on your calendar since that's the type of cat you are.) Spaces are limited, so this plan is the surest guarantee that you don't get shut out of your preferred days. 3.) The Here & There & Anywhere Fare: Reserve some spots now, then reserve the rest when you want using the link provided by Brown Paper Tickets in the confirmation email. As long as it's not full, you can reserve a spot up to one hour before class. Now skip along on your happy way, you delicious free-spirit cat! 4.) The Fly By the Seat of Your Pants Non-Plan: Throw caution to the wind (but save the confirmation email from Brown Paper Tickets.) Wait until you wake up and feel like it. If there's a spot, there's a spot. If not, oh well. You can reserve up to one hour before class by following the link provided in the confirmation email you got from Brown Paper Tickets (unless it's full and then you're out of luck). No need to note classes on your calendar because you're probably making the reservation as you run out the door, you casual cat. can i just buy one class? Yes. Follow the "Buy Only One Class" link to purchase one class on a particular date. The cost for individual classes is $26/class and can be purchased any time after May 25th at 6am. will classes sell out? do i need to rush to buy my pass? Season Passes are virtually unlimited, so you don't need to rush to buy them as soon as registration opens. However, space in each individual class is limited to 12 people; so if you want your choice of dates, you will want to make your reservations early. what if i can't find my confirmation email from brown paper tickets? Call them 24/7 at 1-800-838-3006. They're super nice and helpful! Why do i have to reserve a spot in each class? Our commitment to you is to get as many reps as you possibly can. The only way we can do that is by limited class size. And the only way we can limit class size is by asking you to reserve your spot before you come to class. Once you've purchased your Season Pass, you can follow the link provided by Brown Paper Tickets in the confirmation email, which leads you to a place to make all your reservations for individual classes. On the Brown Paper Ticket link, click the drop-down menu to select the individual date(s) you'd like to reserve your class spot(s). Season Pass holders will not be charged to reserve a spot. do i have to reserve all my classes at once? i bought a season pass. Does it cost money to reserve my spot? No. It's totally free. You already paid for class when you purchased your Season Pass. There's a link for changing dates on Brown Paper Ticket's confirmation email, which should allow you to switch them easily. If that doesn't work, call Brown Paper Tickets's 24/7 Customer Service number: 1-800-838-3006. We're not able to make those changes on our end, unfortunately. But if you run into trouble, email Pam so she can do her best to be of service to you. Help! I've got problems with my brown paper tickets purchase or reservations. Can i really reserve my spot as i'm running out the door to class? Sure, as long as you're leaving at least one hour before class and there's still space in the class. Online reservations can be made until 6pm on class nights. As long as you've got the prerequisites! To take an "all-level" class on Monday and Wednesday, you must at least have completed Zen 1. To take an "advanced" class on Tuesday and Thursday, you must have at least completed Zen 4.
if a class if full, do you have a waitlist? Sign up to the Waitlist using the button here. Please be sure to note the specific date of the class. is there a way i can see how much room is left in a class? Yes. If you're a season pass holder, go to the link supplied by Brown Paper Tickets and click on the specific date in the drop-down menu on the left. It will tell you exactly how many spots are left in each class. The maximum is 12 students. If you are not yet a season pass holder, click the "Purchase One Class" button on this page which should take you to the page with drop-down menu too. DO NOT USE THAT LINK TO BUY SEASON PASSES. When classes do fill up, we will post it on the bottom of this page where we've listed the the line-up of teachers. Additionally, we'll include updates and such in the newsletters. can i share my season pass with a friend? Whatever you arrange between the two of you is good with us. We can't handle any part of the management of card sharing however. Payment and class reservations should be arranged between the two of you. What if i have classes left over at the end of summer? Your Season Pass purchase is non-refundable. However, you're welcome to pass along your unused class(es) to a friend. (Please make the necessary reservations between the two of you as noted above) If you don't know anyone who wants your donated classes, we also are happy to connect you with a student who would like to take you up on your generous offer. If you're on Facebook, list your offer on the School Community Group, or email Pam to let her know you'd like to donate your unused Get Your Reps class to someone looking to take a free class. What if i want to snag one of those sweet donated classes? Post your wish on the School Community Facebook group or email Pam. how do i know who is teaching each class? Go to the individual date on our Calendar here. We have a rotating cast of beloved teachers like Laura Patrick, Julie Waggoner, Kelsey Flynn, Casey Grambo, and of course Scott Braidman and Pam Victor (plus maybe a surprise guest teacher or two!) Scroll down to the bottom of this page for the tentative line up of teachers. what exactly happens in a get your reps class? The overall goal for each class is to get you up on your feet and in action as much as possible. There are no shortcuts in improv. It's all about getting reps, which is the focus of the summer program. The actual contents of each class depends on each teacher, the desires of the students who show up that day, and the way the wind is blowing. As opposed to having a lesson plan with a particular focus, Get Your Reps teachers follow the needs of the students and the moment. You might do some warm-ups, then short scenes, then longer scenes. Or you might do some warm-ups and then a bunch of short form games. An advanced class might do some warm-ups followed by 90 minutes of montages. Or they might focus on a particular form. Or a mixture of all of the above. One thing we do know, you will be getting your reps.
will I know everyone in class? Probably not, but that's the beauty of the program. Though you're probably pretty infatuated and comfortable with your class, Get Your Reps gives you an opportunity to get infatuated and comfortable with a whole new group of people. i want to play with my classmates. how can we stay together? If you and your classmates want to plan a day to stage a mass attendance of a date or make a weekly plan, you are most welcome to organize that amongst yourselves. Any way you slice it, lots of fun ahead! i'm scared everyone else is going to be better than me? Thank you, Calvin. Now shut up. ;-) As long as you follow the prerequisites, you should be in good shape. Yes, there may be students there who have more improv experience than you - that's a good thing! Their experience is going to make you a more skilled improviser. It's fun and easeful to play with skilled improvisers! And guess what? Chances are, someone else in your class is intimidated by your mad improv skillz. Mixed skills programs are excellent learning opportunities. will these drop-ins really make me a stronger performer? what have previous get your reps students said about it? "​I loved being surprised into Get Your Reps each time, because you never knew who your fellow improvisers would be on any given night. The opportunity to work with a range of improvisers and different teachers, the unpredictability of styles and approaches combined with the flexibility of scheduling, added delight and ease." "The GYR sessions during the summer give you the opportunity to practice improv with classmates and meet new friends, keeping skills sharp, and having a blast!" "It’s a great way to get more practice in a fun, safe, and supportive atmosphere! Do it!" About that tentative line of teachers? The most updated list will be listed on the HVC Calendar. Last minute changes in teacher assignments may be made when necessary.